Designed with business storage needs in mind, the 120TB Enteroc N1823 12-Bay NAS Server from Rocstor features 12 drive bays complete with 12 Gb/s SAS/SATA disk architecture for enhanced data throughput. In addition to enhanced data throughput, the N1823 NAS Server comes equipped with four Gigabit Ethernet ports for improved network connectivity and expandability. On the inside of the Enteroc N1823 you will find a 3.1 GHz quad-core Intel Xoen CPU along with 8 GB DDR3 SDRAM cache memory to ensure the NAS operates smoothly even under demanding conditions. Once configured, Enteroc N1823 supports RAID 0, 1, 5, 6, 10, 50 and 60 settings to suit a variety of storage needs. Additionally, users benefit from a variety of backup and data protection features including Volume Clone, iSCSI replication, Amazon S3 backup and more. Rocstor has included their intuitive management utility ProNAS OS and Disk Manager giving users a wealth of tools to full manage this NAS server. From automatic IP address configuration to web browser-based management, central management and more you do not have to be an IT expert to manage your storage. Rocstor even offers a dedicated app avaliable for both iOS and Android further simplifying the process of managing this NAS server. Combining a Dual 10 Gigabit Ethernet and a powerful 12 Gb/s SAS/SATA disk structure with consolidation capabilities and turnkey simplicity. The Enteroc N1823 offers heterogeneous protocols, easy expandability, 12 Gb/s SAS/SATA disk technology and efficient utilization of storage space. It supports features such as VAAI, HA, Thin-Provisioning, Volume Clone, remote replication, Snapshot and data copy options. The N1823 seamlessly integrates into your computing environment and providing a world-class NAS storage solution that delivers down the overall cost of storage while creating the best possible return on storage investment. The Enteroc N1823 is powered by Intel Xeon Quad Core 3.1 GHz processor CPU and 8 GB DDR3 SDRAM memory module expandable to 32 GB. 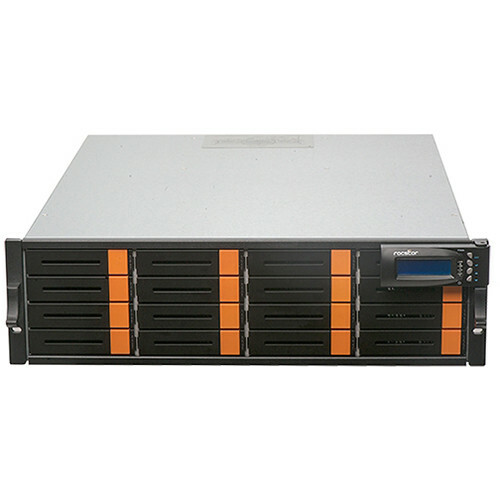 This rackmount NAS storage is a powerful server designed for SMB complex storage needs. The Enteroc N1823 includes a fully-featured backup solution including manual or scheduled backup for file, folder and shared files. It can be backup and restore from multiple local or remote devices. The N1823 features volume clone, snapshot, remote replication and data copy options which are all designed to ensure and enhance your valuable data. For your extensive data protection, the Enteroc N1823 includes an AES-256 logical volume encryption option. If shared folders have not been created in the logical volume setup, the volume can be encrypted by configuring data "Encrypt" option in the setup. After an encrypted volume is created, system will download the key file automatically. The key is a part of the encryption validation and the volume cannot be accessed without key file. The Enteroc N1823 features SSD Caching that enables an SSD drive to be used in conjunction with a high-capacity hard drive (HDD). SSD Caching feature recognizes and automatically stores your most frequently used applications and data into the SSD, while giving you full access to the large storage capacity of an HDD. You can create, work and access your data faster than ever before without paying more for a larger SSD to store our entire data. The Rocstor Enteroc N1823 is full featured and supports Windows LDAP Android/iOS mobile APP for monitoring, Backup/Restore from attached storage (USB/eSATA/iSCSI/RDX/USM), Backup/Restore from remote share (CIFS/NFS), Backup to Cloud (Amazon S3), VMware ESXi 5 iSCSI/FC/NFS VAAI support, Microsoft Windows 98/ME/NT/2000/XP/2003/Vista/2008 /Win7/Windows 2012/Win 8 Unix/Win 10, Linux, Mac OS, iSCSI Target manager which support LUN Mapping/Initiator Filter/Thin Provisioning, Support NIC/Trunking/Load Balance/Fail Over/802.3ad and many more for a true enterprise solution with one of the lowest Total Cost of Ownership storage solutions. The Enteroc N1823 features a robust Data Deduplication option which is a method of reducing storage needs by eliminating redundant data. Only one unique instance of the data is retained on storage media. Data Compression is also a feature of N1823 which provides a reduction in storage hardware, data transmission time and communication bandwidth, hence resulting in data storage cost savings. The Rocstor ProNAS OS and Disk Manger is a powerful and full featured enterprise NAS operating system which provides configuring and managing your NAS data infrastructure easy. ProNAS delivers business featured options that are easy-to-use thru its GUI interface. Simplifying setup and management. ProNAS is built specifically for Enteroc range of NAS storage and delivers optimal performance, reliability and efficiency. The Rocstor Enteroc N1823 is a perfect storage system for virtualization environments, including VMware, Citrix and Microsoft Hyper-V. With VMware vSphere & VAAI integration support. The N1823 also supports iSCSI Target and Thin Provisioning block storage. Consolidating file data with a Rocstor Enteroc N1823 Network Attached Storage (NAS) solution can easily help you to address your changing file serving needs and reduce cost of ownership - enabling simplified management, better resource utilization and centralized growth and data protection. The Enteroc N1823 allows you to share files across Windows, Mac and Linux platforms efficiently and seamlessly. The N1823 supports Backup/Restore from remote share (CIFS/NFS) along with TCP/IP, SMB/CIFS, NFS, SNMP, FTP/SFTP/FXP, HTTP, HTTPS, Telnet, SSH, AFP, WebDAV, Bonjour and TFTP protocols. Number of Bays 16 x 2.5"/3.5"